The "Queen Bee" boat that was lost in the Atlantic Ocean nearly four years ago returns to North Carolina after washing ashore in Spain. WITN's Dan Yesenosky reports. 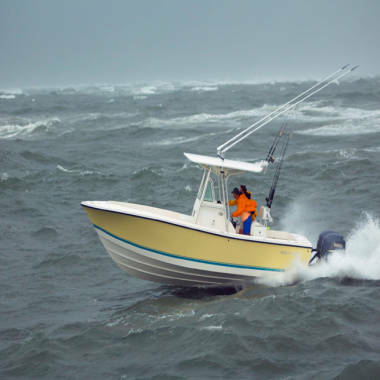 Four years after a strong wave tossed them off their yellow fishing boat, Queen Bee, off the coast of Nantucket, Mass., Scott Douglas and his brother in law, Rich St. Pierre, climbed aboard again -- in a North Carolina parking lot. In January, the U.S. Coast Guard called Douglas to tell him that the vessel, a 26-foot center console fishing boat made by Regulator, had washed up on the Spanish coast. It was rusty and covered in barnacles, but intact. 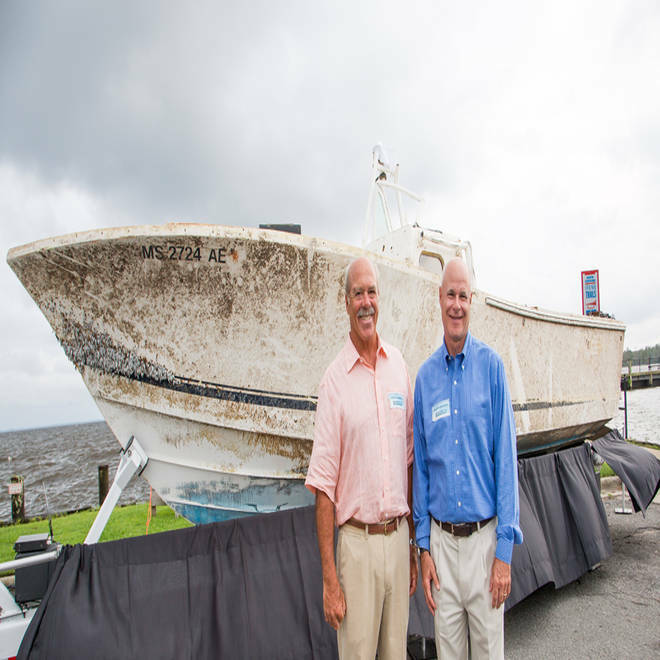 Almost six months later, the North Carolina boatmaker retrieved the Queen Bee and brought it back to Edenton, where Douglas and St. Pierre were finally reunited with it Tuesday. Scott Douglas (right) and Rich St. Pierre reunite with the Queen Bee in Edenton, N.C., on Aug. 28, 2012. It was an overcast and windy August 2008 day, and the two men were out fishing. St. Pierre, 69, was at the helm, and the water was restless. Waves crashed into the boat, rocking it, and a rogue one knocked the two men into the water. Douglas remembers thinking the water was not too cold. "The only way I was going to survive was just to get started, not tread water," he told NBC News in January. The men made their way to shore, swimming more than one mile, and catching one last glimpse of the Queen Bee. It looked "pretty happy," rocking side to side, sailing away from its owner, Douglas said. Lt. Joe Klinker, a U.S. Coast Guard spokesman, told NBC News in January that the most likely scenario is that the boat somehow got out into the Gulf Stream. 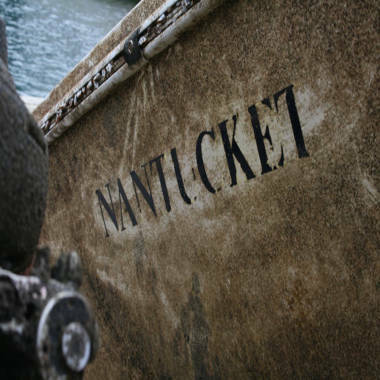 The boat of a man who was tossed off his vessel in the waters off Nantucket more than three years ago has washed up in Spain. WNBC-TV's Katy Tur reports. "From there it may drift north off the coast of northern Canada and then east with the North Atlantic currents," Klinker told NBC News. Based on salvage law, the boat belonged to Spain, but it didn't want it. The Spanish government released it to the insurance company, which released it to Douglas, who, in turn, relinquished it to Regulator. Co-owner and President Joan Maxwell told NBC News she couldn't believe how good the boat's condition was. How the Queen Bee used to look: A 26-foot yellow center console fishing boat made by Regulator. "Unbelievable to think that a boat could survive in the Atlantic for three and a half years," she said. "We have no clue what this boat encountered in the time frame that it was gone." The seats still had their cushions, and the company was able to trade in the boat's batteries, Maxwell said. A nickel was found in the glove compartment. The port side looked as though it might have been hit, but with a new engine, the Queen Bee could sail again, Maxwell said. A boat that was lost at sea off the coast of Massachusetts in 2008 washed up on the coast of Spain more than three years later. Regulator, which employs about 70 people and has been in business since 1988, plans to show off the boat at exhibits and shows this fall. St. Pierre, who now lives in Nantucket and says he is nowhere near as comfortable on the water as he used to be, told NBC News he has written a draft of a children's book chronicling the imagined adventures of the Queen Bee. "The story about the boat has captured everybody’s imagination. You can imagine just what must have happened to it in those three and a half years," he said.